Who administers the New York State Motorcycle Safety Program (NYSMSP)? The NYSMSP is administered by the NYS Department of Motor Vehicles and is operated under contract by the Motorcycle Safety Foundation (MSF). Upon successful completion, you will have learned how to become a safe and responsible motorcyclist, will receive a DMV road test waiver card, and may be eligible for an insurance discount. How do I find a course near me? Click Here to find the training site near you. Locate the site closest to you and give them a call, they will be happy to schedule you into the next available class that fits your schedule. Some sites also offer on line enrollment. The course is approximately 15 hours total. Check with your local training site for scheduling options. The MSF Basic RiderCourseSM (BRC) is designed for beginning riders. Approximately five hours of classroom instruction and 10 hours of riding exercises in a controlled environment provide a complete introduction to motorcycling. The course is conducted over two or three sessions. Motorcycles and helmets are provided for your use during the course. Physical prerequisite: students must be able to ride a bicycle. If you are between 16 and 18 years old you will need the signature of a parent or legal guardian in order to take the course. Ask your chosen site to see if your parent or legal guardian will need to come to class with you. If you are under 18 and subject to the New York State Graduated Driver Licensing (GDL) Law, you may not be able to apply for a full Class-M motorcycle license immediately after completing the course. You may be subject to mandatory waiting periods as specified in the GDL Law. Click here for GDL information. When you become licensed, you will be subject to New York’s Graduated Licensing laws. Do I need to get a motorcycle learner permit before I take the course? 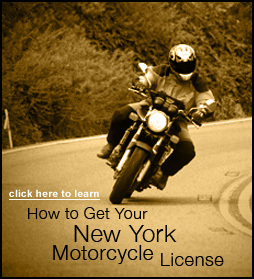 Yes, you must have a valid New York State Motorcycle Learner Permit before you can enroll on a course. (visit http://dmv.ny.gov/driver-license/get-motorcycle-license for additional information). Out-of-state residents may be eligible to take the course without road test waiver benefits. Check with your local training site to see if you qualify. The cost of the MSF Basic RiderCourse will be no more than $275.00 for locations in upstate New York, and no more than $350 in locations near New York City (Rockland County, Westchester County, the five Boroughs of NYC, Suffolk and Nassau Counties/Long Island). Your training site will provide the motorcycle. Helmets are also provided if you do not have your own. Regardless of your riding experience, you are required to wear a DOT compliant helmet during the riding portion of your class. You should come to the riding portion with approved eye protection (ANSI Z87 shatter resistant), a long sleeved shirt or jacket, full-fingered gloves, long pants and sturdy over the ankle footwear (not canvas). You will not be permitted to participate in the course without the required equipment. You must also bring your driver license to the training site. Motorcycles and helmets will be provided for you at the training sites. If you do not pass the knowledge test or the skills evaluation, you can re-take the skills evaluation at a later time, but it must be within the same training season or you will need to retake the entire course. You must schedule the re-evaluation with your particular site. Check with your local site for re-registration procedures and charges. You will receive a course completion card (which is sometimes referred to as a road test waiver card) after successfully completing the MSF Basic RiderCourse. This card, when presented with a valid NYS Driver License and Motorcycle Learner Permit at the DMV, will allow you to apply for a “Class M” Motorcycle License without taking the DMV motorcycle road test. Note- persons who do not possess a valid NYS driver license when presenting the BRC card will not be eligible to waive the DMV road test. Someone who intends to apply for a motorcycle-only license is not eligible for a waiver. Will I qualify for the road test waiver if I completed the course in another state? You must complete a course at a New York State Motorcycle Safety Program site in New York in order to qualify for the waiver benefit. Are accommodations made for US military personnel? Click Here for information on the military conversion program.